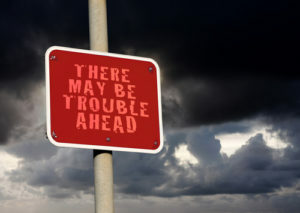 Sources in the aftermarket supplies industry recently made us aware of a change in certain popular HP integrated print-head (IPH) inkjet cartridge families that is beginning to affect inkjet cartridge remanufacturers. According to information on the HP Customer Support website, starting in April 2017, HP began shipping “new updated” versions of several inkjet cartridges, including the HP 63, 65, 123, 302, 304, 652, 664, 680, and 803 cartridges families. Where and In What Are These Cartridges Used? For reference, HP introduced the HP 63/63XL black and tricolor cartridges in 2015 in the ENVY 4520, ENVY 5540, OfficeJet 3830 and OfficeJet 4650 (see “HP Announces Instant Ink Ready Lineup of Inkjet All-in-Ones”). These cartridges are used in a huge array of other models including the DeskJet 1110, 1111, 1112, 2130, 21031, 2132, 2133, 2134, 2136, 3630, 3631, 3632, 3633, 3634, 3635, 3636, and 3638; the ENVY 4511, 4512, 4516, 4522, 4523, 4524, 4526, 4527, and 4528; and the OfficeJet 3831, 3832, 3833, 3834, 4652, 4654, 4655, 5255, and 5258. 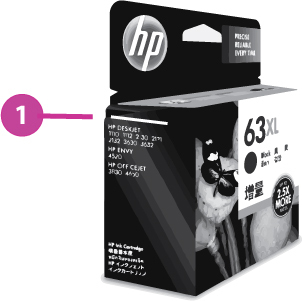 Like most cartridges these days, HP’s are regionalized with the HP 63/63XL being the model numbers for North America and the Asia Pacific (excluding China, India, and Indonesia). This IPH cartridge family is the HP 302/302XL in Western Europe; the HP 123/123XL in Africa, CIS, Latin America, and the Middle East; and the HP 803/803XL in China, India, and Indonesia. The HP 65/65XL IPH inkjet cartridges made their debut in 2016 in the DeskJet 3755 (see “HP Looks to Tempt Cost-Sensitive Home Users with New DeskJet 3755”). These cartridges are also employed in the DeskJet 2622, 2652, 2655, 3720, 3722, 3730, 3732, 3752, and 3758 and the ENVY 5052 and 5055. Again, the HP 65/65XL are the model numbers for North America and the Asia Pacific (excluding China, India, and Indonesia). The corresponding cartridge models cartridges are the HP 304/304XL in Western Europe; the HP 123/123XL in Africa, CIS, Latin America, and the Middle East; and the HP 803/803XL in China, India, and Indonesia. Meanwhile, the HP 664/664XL, 680/680XL, and 652/652XL are used in various DeskJet Ink Advantage models sold in emerging markets, including the DeskJet Ink Advantage 4535, 4536, 4538, 4675, 4676, and 4678. The HP 664/664XL cartridges are sold in Latin America; the HP 680/680XL cartridges in Asia Pacific; and the 652/652XL cartridges in Europe, the Middle East, and Africa. The installed base of printers using these cartridges is enormous and growing. HP continues to roll out new hardware based on these cartridges, and the inkjet models that employ these cartridges are some of HP’s top-selling models. HP introducing new versions of these cartridges affects inkjet cartridge remanufacturers because the pool of empties that remanufacturers are currently using will almost entirely be of the older cartridges. And if a customer has a newer version of one of the aforementioned HP printer models—one manufactured after May 1, 2018—it is likely that a remanufactured cartridge will not work in the printer because that empty cartridge will be the older type of cartridge. 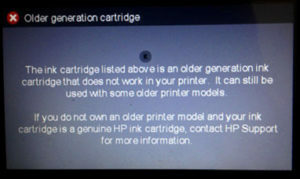 When an older cartridge model is installed in one of the newer printers, the printer displays an “older cartridge” error message and won’t print. The language of these error message can vary, as described on the HP Customer Support site. HP says, “It is easy to figure out if you have the updated version of these cartridges.” However, the differences between the old and the new cartridges are subtle and end users would have to know to look for these differences when shopping for new OEM cartridges. On the side of the cartridge packaging, new cartridges have a line above the list of compatible printers, as shown in the photo at left. Older cartridges have no such line. If the cartridge is out of its packaging, the only way to tell is by finding the part and cartridge number on the label on the top of the cartridge and searching for the warranty end date. HP has provided a table and says if the warranty end date is after certain dates ending in 2019, the cartridge is a new updated one. 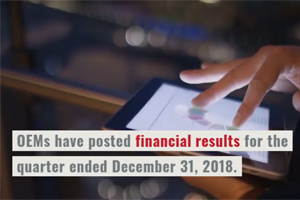 While this presents some challenges for purchasers of new OEM cartridges (at least until HP manages to turn over all the old inventory), it is a much bigger headache for owners of newly made HP printers who want to purchase remanufactured cartridges. These customer will essentially have no way of knowing when buying the remanufactured cartridge whether it uses the old or the new core. But, as explained above, it is far more likely than not that the remanufactured SKU will be based on an older cartridge and thus the end user may see a printer error and be unable to print. This, of course, gives the end user a very negative experience with using remanufactured cartridges and may deter them from using non-OEM cartridges in the future. The change will have a more limited impact on refillers because end users typically bring in their own spent cartridges to refill. There are, however, certain scenarios in which refillers might be impacted. For example, if a customer has bought a new HP 63-based printer to replace an older HP-63 based printer and refills a cartridge that was used in the older device, it may not work in the newer device after refill. We think folks in the aftermarket are just raising the alarm about the new versus old HP cartridges now because HP’s change is only now becoming a problem. With the first new printers that can only use new cartridges shipping in May of this year, it is only now, three months later, that some owners of these printers are purchasing replacement cartridges and finding that remanufactured cartridges will not work in their device. This not the first time HP has rolled out new versions of certain cartridges models, causing problems for remanufacturers. HP has done this previously with both IPH cartridges and ink tanks. What Has HP Actually Changed and What Is HP’s Motivation? We sent HP several questions about the change to the new cartridges. We wanted to know how the new cartridges differ from the old, what was the purpose of introducing new cartridges, was there some benefit to the end user of the new cartridge design, whether HP was concerned about customer confusion stemming from the decision to keep the same cartridge model numbers on the new and old cartridges, and whether the fact that the cartridge change would present problems for remanufacturers played a role in HP’s decision. HP periodically updates our cartridges with new features, whilst keeping the same product number to avoid additional cost and confusion for customers and partners. The updated HP ink cartridges are compatible with both current and future printers, while older versions of the cartridge will not work in newer printers. We always recommend customers check for cartridge compatibility on printer packaging before purchasing. For more information please visit www.hp.com/go/learnaboutsupplies. It makes sense that if HP had introduced new cartridge numbers that could have been even more of a hassle for resellers and confusing for customers. But there seems little question that what HP has done is confusing as well—hence, the existence of a support page designed to help users distinguish between the cartridges. HP’s comment leaves unanswered the bigger question: why introduce new cartridges at all? If HP had not introduced new cartridges, there would be no potential confusion. While HP is not commenting on what exactly has changed in the new cartridges compared with the old, our sources say they cartridges look identical externally (aside from the warranty dates). There is the same number of contacts on the new and the old print heads, for example. But our sources say the new cartridges use a different print head than the old—presumably with a new Acumen chip. One remanufacturer says the internal program of the cartridges has changed, including information on the expiration date of the cartridge. The newer printers—those manufactured after May 1, 2018—must have differences as well, most likely to the firmware, as the “handshake” between the printer and the chip is affected so that new cartridges can be used in the new printers but old cartridges cannot. HP has not stated what the “new features” of the new cartridges might be or how they benefit end users, but those in the aftermarket with whom we spoke are sceptical that there are any new features designed to benefit end users at all. They see HP’s decision to roll out new cartridges as a definite shot at the remanufacturing industry. Of course, it is possible that the new cartridges have some key improvements or features HP has yet to disclose. However, even if hurting the aftermarket was not the primary goal of HP’s two-fold plan of introducing new cartridges and then introducing new printers that can only accept the new cartridges, it is certainly a nice additional benefit, at least from HP’s perspective. For the aftermarket, thus is yet another hurdle set up by OEMs that they must find a way to leap over unless they are willing to cede the replacement cartridge market back to the OEM.